This is the first time since July that Trump has fallen out of first place. Republican presidential candidate Ben Carson has moved ahead of real estate magnate Donald Trump, taking first place in the Republican presidential field in a new CBS/New York Times national poll released Tuesday. The retired neurosurgeon now leads with 26 percent of the vote, to Trump's 22 percent. The results are within the poll's 6 percent margin of error, but a four percentage point difference represents a high likelihood that Carson is in fact in the lead. The rest of the Republican candidates only managed to pull in single-digit support. Sen. Marco Rubio (R-Fla.) drew 8 percent of the vote, while both former Florida Gov. Jeb Bush and former Hewlett-Packard CEO Carly Fiorina got 7 percent. Support for all other candidates was at or below 4 percent. According to HuffPost Pollster's national chart, which aggregates all available polls, Trump continues to lead Carson by 7 points. Since the new CBS/NYT poll is the only recent one to show Carson in first place, it has not swayed the overall HuffPost Pollster trend. Although it's still too early in the primary process to read very much into these polls, as most people are still making up their minds about who they will eventually vote for, the CBS/NYT poll represents a significant shift in the race. It marks the first time since July, when CBS and the New York Times began their joint polling on the 2016 Republican presidential candidates, that anyone has overtaken Trump. As recently as September Trump was leading Carson by four points in a previous CBS/NYT poll. 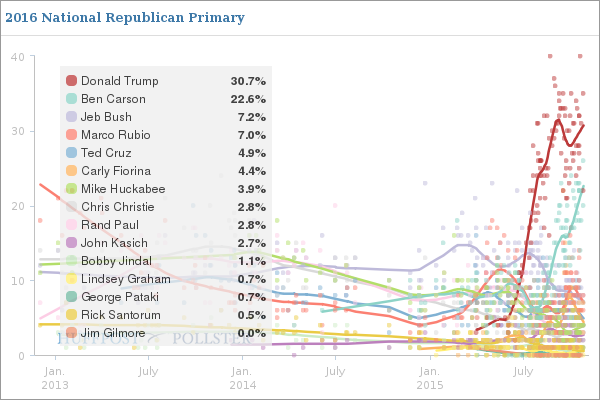 Carson has also gained momentum in the early primary state of Iowa. Six new polls released this week show Carson tied with or ahead of Trump in the state. The CBS/NYT poll surveyed 575 likely Republican primary voters using live interviews to cell phones and landlines between Oct. 21 and 25.